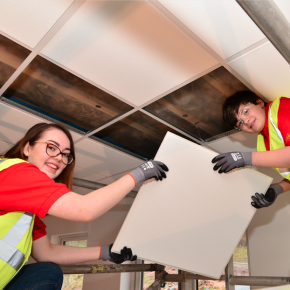 Armstrong Ceiling Solutions‘ new 100% recyclable Dune eVo tile is helping to offer a new beginning for scouts in Derbyshire. The project comes as part of Armstrong’s ‘New Beginnings’ initative to support community projects. 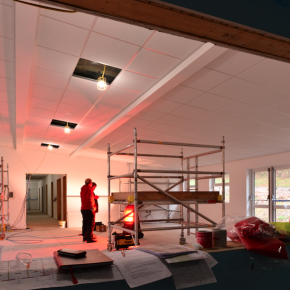 The initiative gives community projects like the Drum Hill Scout bunkhouse the opportunity for a ‘New Beginning’ with an aesthetically and acoustically improved ceiling. Previously, the Scouts had used a former Rolls Royce canteen but it had reached the end of its 50-year life span. Consequently, the brief for the project, from Maber architects, included the creation of a future-proof, durable, state-of-the-art camping bunkhouse. 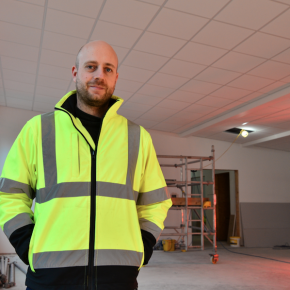 After five years of fundraising £200,000 as well as product donations from companies such as Armstrong Ceiling Solutions, the new building has been achieved, including a training/dining hall, kitchen and bunk rooms with associated services for up to 44 residents and the local Derbyshire community. The Cradle to Cradle TM accredited system comprises 190m2 of Dune eVo Tegular tiles on a Prelude 24mm grid with TLS cross tees features in the entrance, main hall and corridors of their 368m2 new bunkhouse, while 56m2 of Hydroboard Tegular tiles feature with non-corrosive grid in the kitchen, shower rooms and toilets. Kevin Leahu of Peveril Interiors, who volunteered to work on the project, adds: “We prefer to use Armstrong Ceiling products. They have never let us down and adding the new Dune eVo tile to the range has gone down really well with both the clients who value the aesthetics and performance and our installation teams who value the new tougher edge which gives a much better installation experience. “We have made a good choice, both aesthetically for now and environmentally for the future. Young people will use this building for generations to come and deserve to be left with a product that is completely recyclable,” Kevin concludes. As part of Armstrong’s ‘New Beginnings’ initiative, the company is running a social media competition in May and June for one community-based project to win a new beginning for their ceiling space. Community groups interested in applying to win 250m2 of Dune eVo tiles and grid and up to three days of free installation should apply here. For more information visit the Armstrong Ceilings website or go to #eVoNewBeginnings.